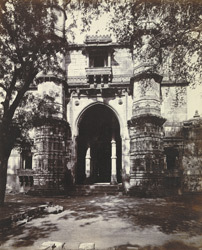 Photograph of the Jami Masjid entrance at Champaner taken by Henry Cousens in the 1880s, from the Archaeological Survey of India. This mosque, built in 1523 by Sultan Mahmud Begarha (r.1458-1511), is one of the most important architectural achievements of the period. The eastern facade consists of five pointed archways; this view shows the larger central arched entrance flanked by two minarets. The base of the minarets, up to the vertex of the central doorway are elaborately carved, above this are cornices at intervals. There are two projecting windows, or oriel windows, on either side of the minarets.